Gallant offers Rodent Exclusion, Trapping, Attic Cleanout and Exterior Baiting Programs. Rats are instinctively wary of rat control measures such as traps and bait, and colonize in attics, burrows, under concrete and porches, in wall voids and other hard to reach places. Rats can harbor and transmit a number of serious diseases. They can also introduce disease-carrying parasites such as fleas, lice and ticks into your home. They invade your home seeking food, water and warmth. Without rodent control intervention, one pair of rats may produce 200 offspring in four months. 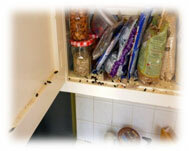 Each rodent can contaminate much more food than it eats. 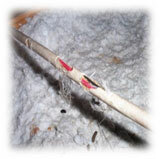 Rodents chew on anything available to them and cause great damage in and around homes. The feces and urine of some rodents may contaminate surfaces with which they come into contact. If you are hearing noises in your attic or walls, chances are you have rodents. Call Gallant to schedule your rodent inspection and treatment.